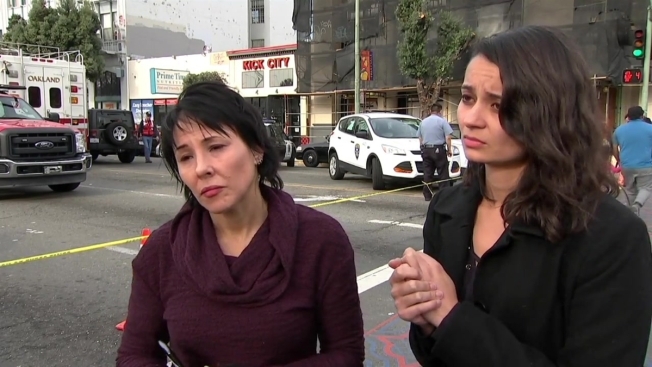 Nikki Kelber and Carmen Brito were resting inside the Oakland "Ghost Ship" warehouse late Friday night before a life and death scenario flashed right in front of their eyes. "I came out of my space and saw an entire wall on fire 20 feet from where I was standing," Brito said as anguish echoed from her voice. "I just knew there was nothing that could be done." In a matter of 30 seconds, Brito managed to make a beeline for the front door and escaped the inferno consuming her home. She described the entire ordeal by saying "everything happened so quickly." Her friend, Kelber, jumped from her loft, grabbed her cat and switched on a head lamp to help navigate the foggy maze. Her ghastly escape through the dark was complete in a matter of moments. "I feel like it was 30 seconds from when I looked down the hall to when it was pretty much engulfed," Kelber said. "It was so fast." Kelber and Brito, overcome by shock, are struggling to digest the magnitude of the loss. Brito said their fallen neighbors inside the warehouse weren't just acquaintances. "We were a family," she said. "We all looked out for each other. We all helped each other. It wasn't just like, 'Oh, yeah, that's my roommate.' It's like, 'Those are my friends. This is the person I eat dinner with.'" Others who are living to tell another tale following the deadly blaze have described the "Ghost Ship" building as a "tinderbox" chalk full of wooden furniture, artwork stacked floor-to-ceiling in several rooms and a controversial staircase, which some say was rickety and constructed out of wood pallets. Ajesh Shah, an Oakland man who had visited the "Ghost Ship" in the past, said the warehouse was a "disaster waiting to happen." A recently-deleted post on Reddit, which was picked up by the Daily Mail, depicts a daring attempt by someone who was allegedly forced to flee the flames on the warehouse's second floor. The person reportedly made a "coin-flip" decision to bolt for an exit, "slipped and slid down" the "worst crafted stairs ever," and crawled around on the bottom level in search of a way out. "I was down (on the floor) and I was having trouble finding the exit," the person wrote on Reddit." At this point I genuinely thought I was going to die choking on smoke in these horrid conditions." After what felt like an "eternity," the person wrote that they heard a man yelling "this is the exit!" The Reddit user followed the voice and barreled out of the burning building. "People were covered in soot and crying and hugging each other and screaming," the person wrote. "Lots of people were calling out their friends names in an effort to find them." As of Monday at noon, a total of 36 people have died following the blaze. Those who survived and used to call the "Ghost Ship" home are now left to pick up the pieces. Kelber called the building a "beautiful, amazing, creative space that was our chosen home" and admitted that settling down in such a structure, which has been criticized for previous code violations, was her only solution to the skyrocketing rent prices in the area. "The housing crisis in Oakland, in the Bay Area, is unprecedented," she said. Brito voiced a similar sentiment and called for issue of affordable housing to be addressed. "We need to stop focusing on what individual people did or didn't do and look at the larger system that is forcing thousands of people to live in less than ideal housing situations," she said.